RDE's Goldfinger, ID# 35359388 has amazing luster, fineness, independant lock structure and density. 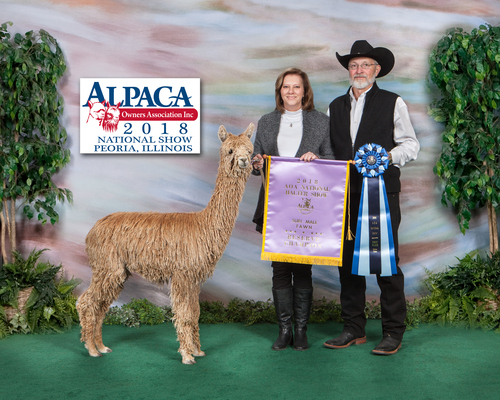 As a juvenile in 2018 he won Reserve Color Champion at AOA National Halter show in Halter and Color Champion in Walking Fleece. He also won several 1st place winnings. 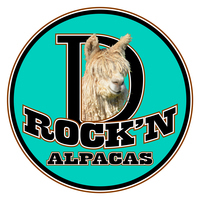 This guy is already rock'n the show ring. Goldinger's sire is the one and only Lazy G's Accoyo Goldstar. 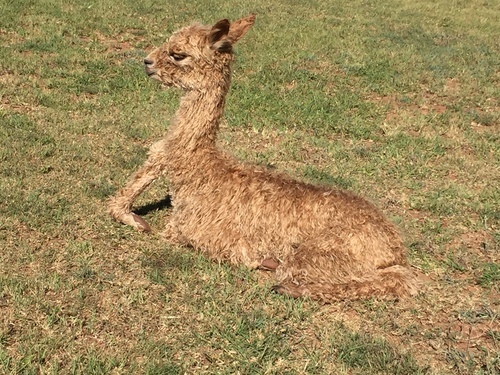 His dam was never shown but she has produced several banner winning offspring. You can't go wrong with the Goldstar bloodline and he will surely make someone a tremendous herdsire. Get your hands on this stunning, eye catching guy early! He will bring a lot of attention to you and your farm with genetics from Goldstar!!!!!!!!! 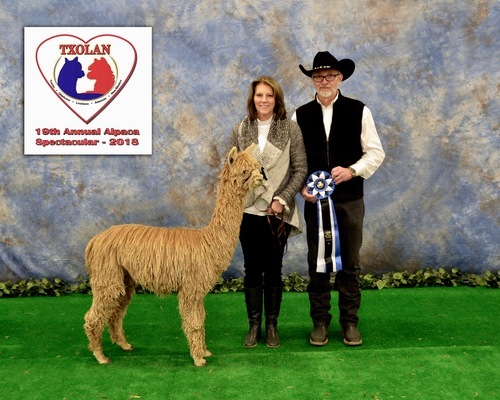 2019 TXOLAN Walking Fleece - Goldfinger received top scores in fineness/handle, uniformity of micron, lock structure, density and luster. The judges say there are no perfect alpacas but he got pretty close according to the score. 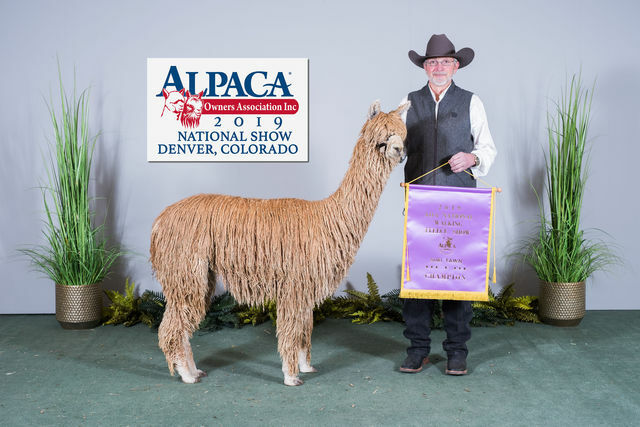 He won Color Champion in Walking Fleece at 2019 AOA National show and 4th place in a very competitive halter class. 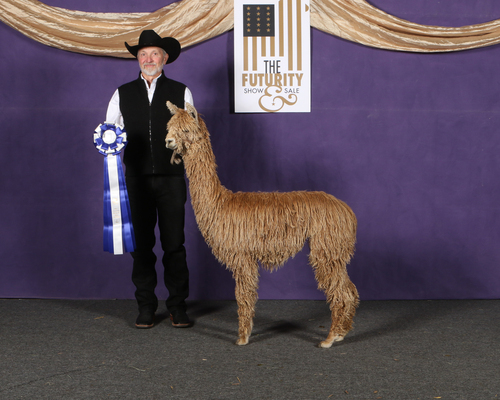 Best Bred and Owned at Futurity!!!! 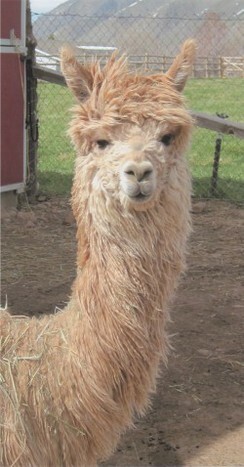 This guy is ready to be shorn and start workn the ladies. Add him to your breeding program and get the Goldstar genetics started. Please inquire about the available financing options. We will help to find a financial option that will fit your situation!